Florida Miniature Pinscher Rescue View other Miniature Pinschers for adoption. Cooper was found on the street 3 months ago by me, we are located in BISCAYNE PARK, (NORTH MIAMI) came right to me, he was hungry and thirsty, he is under vet care now, completed heartworm treatment and will be vaccinated and neutered soon, he is doing GREAT, he very much wants to be part of the dog pack, loves my 2 dogs, and the cat and pomeranians next door! He is learning manners and doing quite well with that, he needs his forever home so badly, he is a sweet, affection, smart little guy. His ONLY issue is scared when a man stands over him or another dog and slowly reaches down, he must have been abused...otherwise gets along great with my husband and adult son. 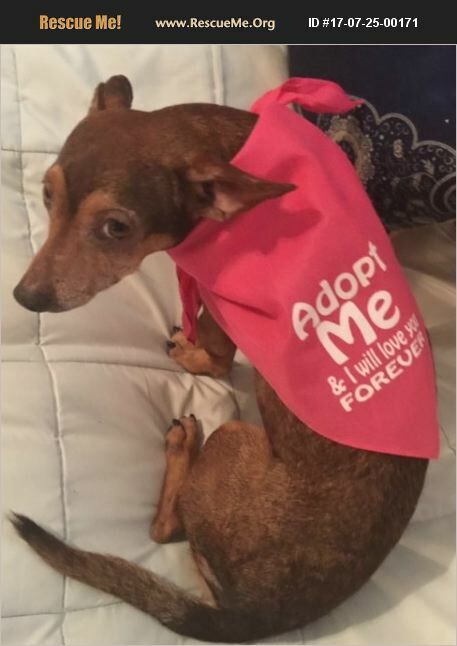 He would be best in a home with at least one female, and would LOVE other small dogs!